ANIMAL FUN - CERAMIC WHITE, PINK, GREY PIG VASE - PEACH, ROSE PINK, GREY, WHITE, CREAM, PURPLE, GREEN, BLUE MIXED FLORAL by Peters Partners Design at Animal Backgrounds. Hurry! Limited time offer. Offer valid only while supplies last. I found some beautiful silk flowers that I thought would be wonderful for a medium vase. I found a ceramic pig vase that measures 5.5'' X 6.5'' X 3''. I found some beautiful silk flowers that I thought would be wonderful for a medium vase. I found a ceramic pig vase that measures 5.5" X 6.5" X 3". It is colored in white, pink, & grey. 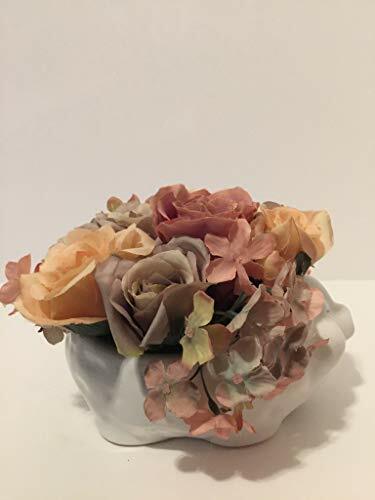 The flowers are arranged in the vase using foam, wire, moss, and glue.